Considering these problems, a team of researchers from Tokyo Institute of Technology (Tokyo Tech), led by Professor Jun-ichi Imura, developed a novel UC method with an interesting twist to overcome the abovementioned issues. “The proposed method has advantages over previous UC methods in several ways and explicitly addresses their main issues,” explains Imura. In their approach, instead of taking the scheduled period as a whole and having to deal with system dynamics, the period is divided into timeslots to be dealt with (optimized for) individually in “real time”. 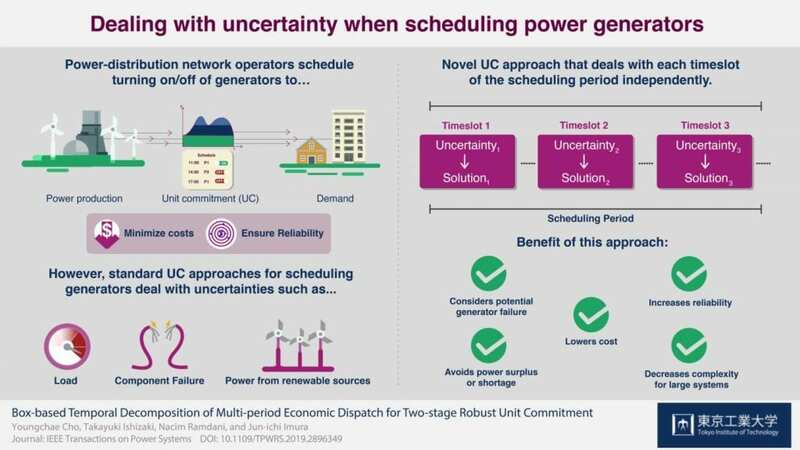 To do this, the uncertain values in the model are independently given upper and lower limits for each timeslot, and the interplay of these limits and other constraints are used to derive feasible optimal solutions. What’s more, the method can be adjusted to consider potential generator outages.